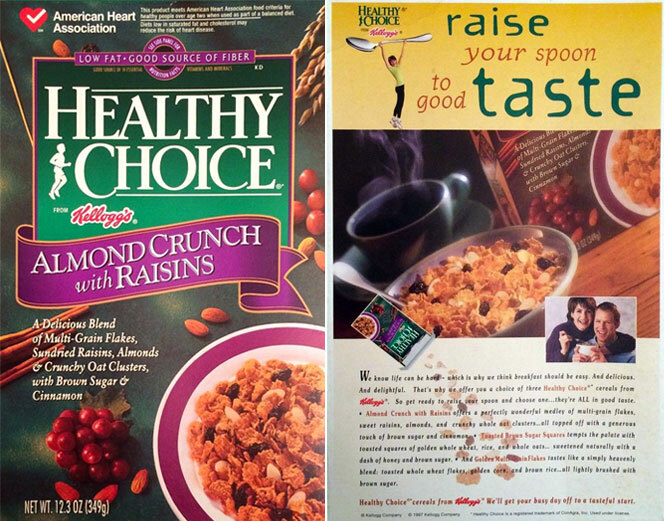 In 1994, Kellogg's introduced three Healthy Choice Cereals: 1) Almond Crunch with Raisins; 2) Toasted Brown Sugar Squares; and 3) Golden Multi-Grain Flakes. We believe the Almond Crunch variety may have been called Multi-Grains, Raisins, Crunchy Oat Clusters and Almonds Healthy Choice when the cereal first came out - as that's what the box seems to say in a grainy 1994 commercial we found. "We know life can be hard - which is why we think breakfast should be easy. And delicious. And delightful. That's why we offer you a choice of three Healthy Choice cereals from Kellogg's. So get ready to raise your spoon and choose one... they're ALL in good taste. Almond Crunch with Raisins offers a perfectly wonderful medley of multi-grain flakes, sweet raisins, almonds, and crunchy whole oat clusters... all topped off with a generous touch of brown sugar and cinnamon. Toasted Brown Sugar Squares tempts the palate with toasted squares of golden whole wheat, rice, and whole oats... sweetened naturally with a dash of honey and brown sugar. And Golden Multi-Grain Flakes tastes like a simple heavenly blend: toasted whole wheat flakes, golden corn, and brown rice... all lightly brushed with brown sugar. "Healthy Choice cereals from Kellogg's. We'll get your busy day off to a tasteful start. 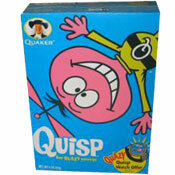 "With so many healthy cereals out there, the choices can be overwhelming. So for the first time... 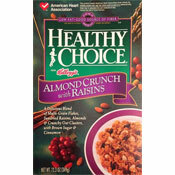 Healthy Choice and Kellogg's have joined up to make your choice simpler. You know, we can handle the tricky stuff with all these nutritional things so you can just concentrate on taste. Our crispy multi-grain flakes, crunchy oat clusters and plump, sweet raisins taste so great. You could make this choice blindfolded. Introducing Healthy Choice cereals, new from Kellogg's. One taste and the choice is simple." To make matters a bit confusing, we also found an image of box of Healthy Choice Mueslix from Kellogg's. That cereal wasn't part of the original announcement about the Healthy Choice and Kellogg's partnership and we've found no other information about it. What do you think of Healthy Choice?